Stock market volatility is at all-time lows. Valuations are near all-time highs using any number of different measures. Yet the key economies are having a historically weak recovery. It looks crazy and it is. What has made it possible is the greatest debt bubble in history. 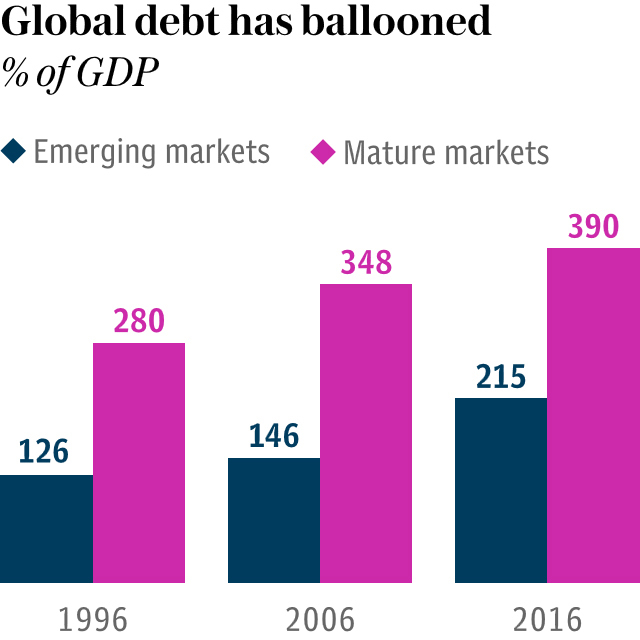 According to the Institute of International Finance (IIF), total debt levels, including household, government and corporate debt, climbed by more than $70 trillion over the last 10 years to a record high of $215 trillion in 2016, the equivalent of 325% of global GDP. This is absolutely unsustainable in two ways. First, the world economy (about $95 trillion in size) cannot earn enough to service this debt. Much of it was incurred for government programs, share buybacks and other unproductive expenditures rather than revenue-producing assets. Second, the debt must continue to grow so that borrowers can refinance to prevent a wave of defaults. How could this debt bubble happen? 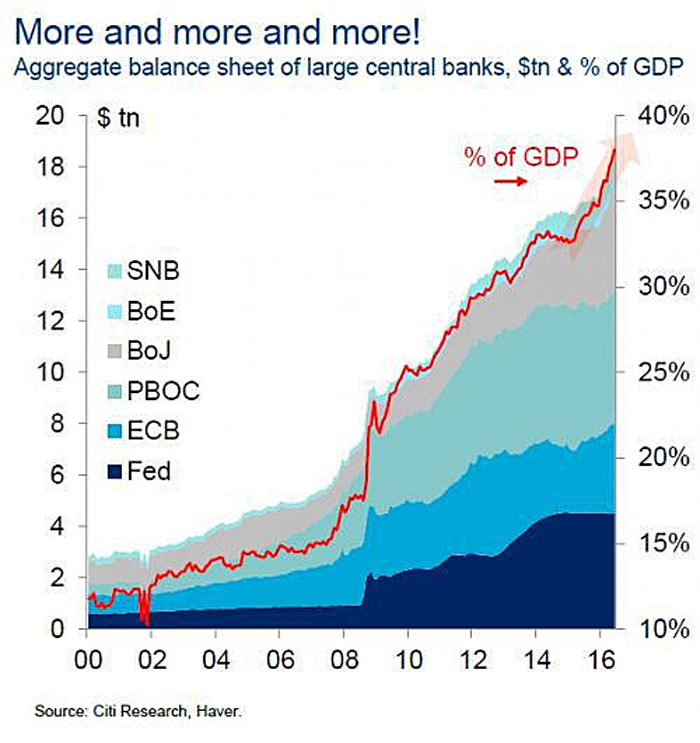 Here’s how…the expansion of central bank balance sheets. The following chart combines the balance sheets of the six largest central banks and compares the total to the aggregate GDP for those six countries. In the year 2000, the combined balance sheet was about $3 trillion, accounting for about 15% of aggregate GDP. Today, we are nicely over $18 trillion, equal to nearly 38% of GDP. Increasing holdings by six times in 16 years is amazing. Growing those holdings 2.5 times faster than the economy is even more amazing. Central banks have constructed a house of cards and we are living in it. Self-protection is vitally important because history, and common sense, tell us that debt bubble dynamics like this must and will implode. I suggest protecting yourself with some gold, not because it will go up in value tomorrow but because, whatever happens, it will have value tomorrow. When the bubble collapses, much of the ‘wealth’ you are counting on won’t survive. Next Next post: Is China Now Rolling in Reverse?